Meanwhile,Wanita Chief of Pending Winnie Lim mentioned to the journalist this will make us work harder to strenthen the BN machinery in anticipation of the upcoming GE13. We are not competing with anyone and we are playing a supplementary role to assist our component party SUPP in P195 and P196. The programme/concept is collectively well received by members of 4 component parties. If the opposition parties thinks that its going to be a “walk in the park” against BN they are in for a real fright come this GE13 says one of the BN Youth Exco. PRU13 “Pakatan Joining In December/March..?? Oooh Yeah.. Just being reminded by a component Sarawak State BN Secretary-General that he will be taking the flight out today to KL. Nerve racking for sure he says as on November 1st Najib will be meeting BN State leaders in Putrajaya. The adrenalin is building up as he spoke to us as he anticipates that the PM will be asking a million and one questions on his party. Well,we shall know soon wouldn’t we? The signs plus signals are positive that the PM wants to consider all options before he announces the Parliament dissolution to prepare for GE13. Could he justs..hmmm? Absolutely,they have got nothing to lose by waiting. The mandate is given by the people of the respective states and they will see it out serving the people who voted them in. The twists might even be that one or two of the BN States co-opted out and just concentrate on the Federal elections to also derail Pakatan. Anything is possible in politics. COULD BN BE SMART ENOUGH FOR THIS…?? YOU ARE.PICK UP YOUR PHONE NOW.. The speed in which Vice President Sylvester Entri capitalised on the weaknesses of President Mawan is an opportunity which he has been reminded that he has to exploit. Entri acted fasts with his group who remains intact after the State elections. Mawans right and left arm has been severed in that he not only losts his SG Nelson who was not renominated to stand but also his Deputy President Nyarok who losts to PKR Ali Biju in Krian. The party will surely be divided no matter what happens now and the only way to see an end to the infighting would be a TDC where the winner takes all. The fractures are highly visible and both sides would not just give in as the real ” war ” in the State elections is already achieved. The battles and skirmishes within SPDP will carry on and the vultures will circle around the party hoping to pick up what is left behind. Entri is moving ahead with his agenda and he is fighting for the ultimate prize.He is capitalising on the ever growing disturbing distrusts amongst the party faithful towards the President and sees himself as a Champion in unifying the resources available in the party to achieve his goal. The President remains unmoved as he knows the majority are with him but the numbers can easily be switched as time and time again political scenarios changes and at times of crisis it will always be very fluid. Certainly there has been whispers on the ground that one or two of the MPs might just take this opportunity to be aligned to Entri as it was mentioned that Mawan has said only ‘winnable candidates” will be picked for the General Elections. The question is the party can recommend but who has the final say? The ticket is still a “Federal Barisan National Candidate” Of course they will be lobbying for the seat but even if the Party President says he is my man but if the BN Federal Chairman decides otherwise chances are the party still needs to toe the line. Entri according to our source is moving in this direction and he knows that the “strong hidden hands” are all out to assist him. Will Mawan be fooled by this political strategy thrown down by Entri’s Hidden hands? Mawan has shown to be cool and calculated unlike Entri as per this newpaper article” was seen as ‘jumpy’ after SPDP president William Mawan advised party members not to create any more factions.” Mawan still has strong man MP Tiong behind him for advise and the financial pull but one cannot underestimate Entri too. BN knows that it musts see an end to this infighting and of course there musts be a ‘negotiator’ in place. It does no good to BN and Pakatan will and make no mistake about it as Azmin has already sounded the battle cry. The cracks in SPDP will surely be an advantage and PKR/Pakatan knows that the 4 seats which SPDP holds will provide them that opportunity. 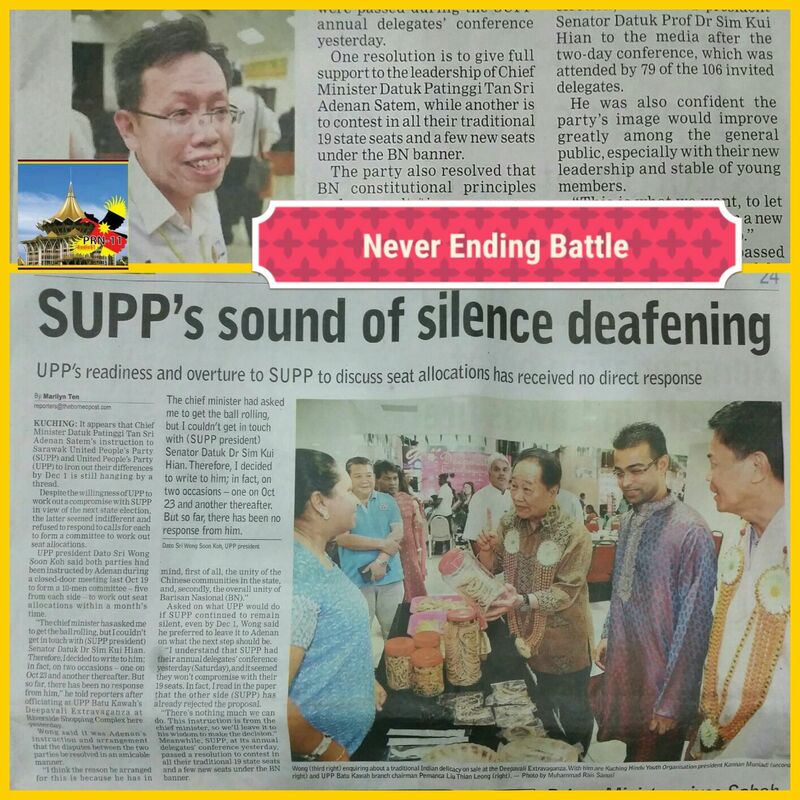 The sooner the misconceived disagreements be settled the better it is for BN/SPDP. On paper PKR will also have marked winnable seats from SPDP. The political vultures are circling above and we don’t need to have a political degree to work it out. It seems that Anwar will be in Kuching on the 30th of March to announce some of the candidates and the number is Taibs Favourite No which is 9. Besides that he will be giving to the candidates “$900,000.. each” to wrestle this 9 winnable seats. Is this the carrot to tempt the PKR candidate for shopping..?? Will BN candidates be tempted..? Surely, someone must be just pushing up the numbers of ringgit available as Baru Bian on the other hand seems to be asking for donation. Baru Bian must have been too tired to wait for the $$$$$$ from PKR Headquaters or the financiers and thats why he is quietly looking at alternatives for funding the Sarawak elections. Goes to show that in desperate times people might use other measures to find solutions and answers. Wow..!! Any takers for Anwars $900 K..?? Surely the BN will not be fooled by the offer on the table if there is any. What else will they come up with next.? By the way for those who dont know where Serikin is please “google’ it up. The press will have a field day on the 30th and the political boys from BN will be watching and having their ears on the ground. Anwar should have just come on the 1st of April shouldn’t he..? ?